Reports over Donald Trump Jr.'s meeting with a Russian lawyer during last year's presidential campaign have reached a boiling point. The New York Times published a piece Monday night that the president's son knew that she had information that could be potentially damaging to Democratic presidential candidate Hillary Clinton. They cited anonymous sources who reportedly had the emails to prove it. 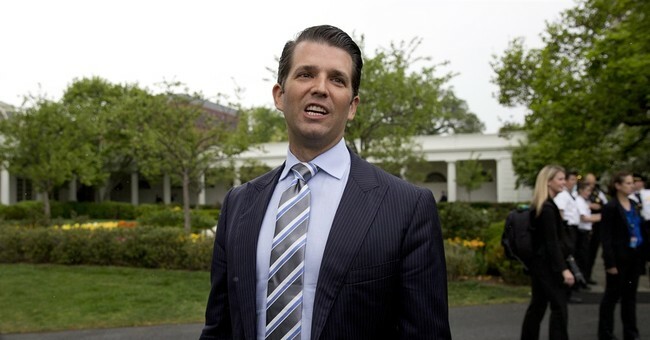 Trump Jr. has released his entire email chain between him and publicist Rob Goldstone that unfolded ahead of his meeting with Russian attorney Natalia Veselnitskaya in order, he says, to be "totally transparent." As you can see, Goldstone first tells Trump Jr. that the Russian government has information that could benefit his father's campaign. Social media users are zooming in on the part where Goldstone tells Trump Jr. that the information the Russian official has "is obviously very high level and sensitive information but is part of Russia and its government's support for Mr. Trump." He also said the documents would likely "incriminate" Clinton and be "very helpful to his father." Trump Jr.'s response: "I love it." That turned out not be the case, however, according to Trump Jr. In statements following the initial Times report, he said their discussion ended up being about adoption - not the campaign. Trump Jr. is calling the media "desperate" in its search for collusion between Russia and the Trump campaign. He has also agreed to testify before the Senate Intelligence Committee, if it comes to that. As for Veselnitskaya, she has denied any connection to the Kremlin.